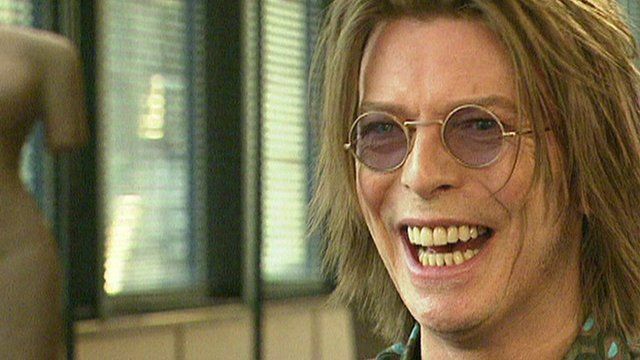 Bowie on music, drugs and the internet Jump to media player David Bowie was interviewed by BBC Newsnight's Jeremy Paxman in 1999, in which he spoke about music, drugs and the "unimaginable" impact the internet was going to have. Did David Bowie sing his own epitaph? Jump to media player David Bowie's album Blackstar was released two days before his death, and was intended as a "parting gift" to the world according to his producer Tony Visconti. The business of being David Bowie Jump to media player The upcoming David Bowie exhibition at London's V&A has become the fastest selling in the museum's history. When David Bowie played the outback Jump to media player Thirty years after the Let's Dance video was shot, the remote Australian town of Carinda hopes its association with David Bowie will save it from extinction. 'Lost' Bowie video has been found Jump to media player David Bowie's performance of Jean Genie on Top Of The Pops in 1973, that was thought lost, has recently been found. Music legend David Bowie, who has died of cancer at the age of 69, was interviewed by former BBC Newsnight presenter Jeremy Paxman in 1999. He also predicted the huge impact the internet would have on society, describing the implications as "unimaginable". And he said he had "lost track" of the different ways his name, Bowie, had been pronounced. Go to next video: Did David Bowie sing his own epitaph?